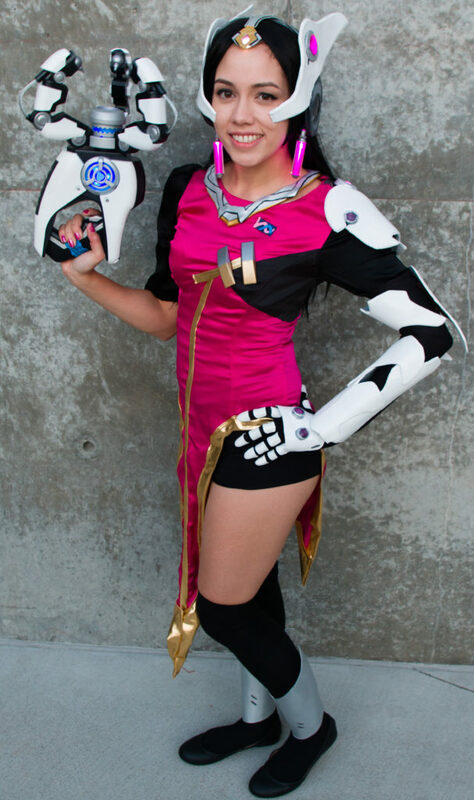 Overwatch Cosplay At FanimeCon 2018! Overwatch has been my main game of the past couple years. Every now and then a new game comes out, but after completing said new game, I’d find myself drifting back to Overwatch. It’s kind of like a go-between game, filling the gaps before something else jumps my way. Well, for the past couple months my entire gaming life has been encompassed by Blizzard’s shooter. And no, not because I’ve been playing it nonstop and got invited to join the Overwatch League. 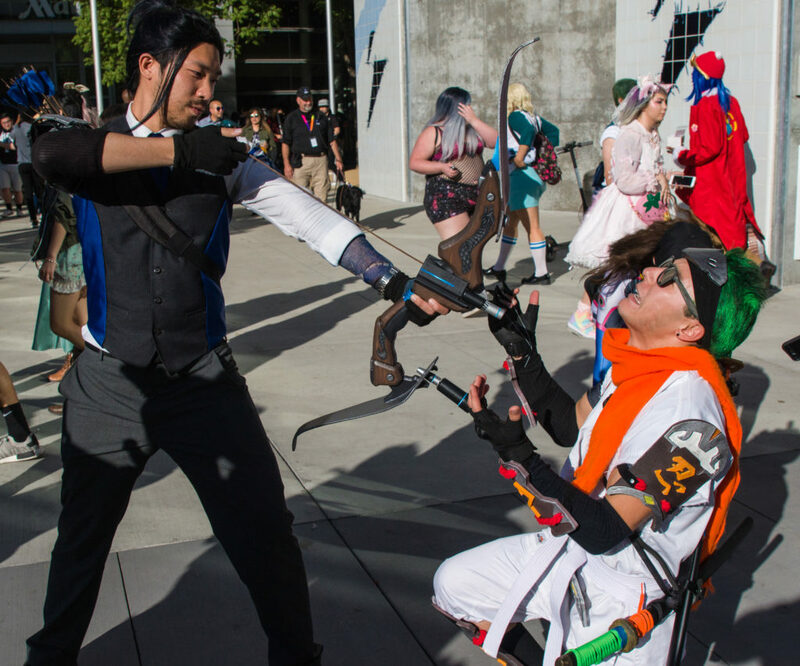 Rather, we recently attended a convention and dressed up as some of our favorite characters! 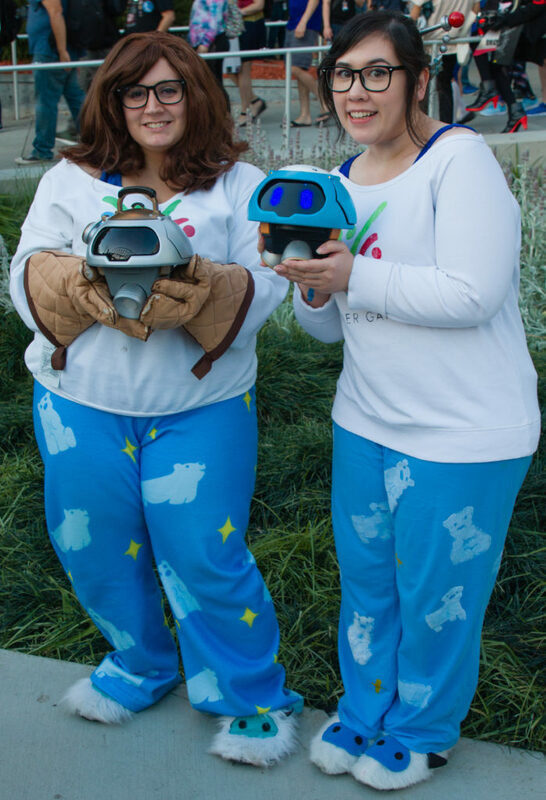 If you’ve frequented this blog back when it was Slick Gaming, you might remember my girlfriend Laura and I cosplaying as Animal Crossing characters. While that was awesome, cute, and fun all at the same time, it wasn’t a true, full-on cosplay. We were dressed up, sure, but we only really had hats and a few props. 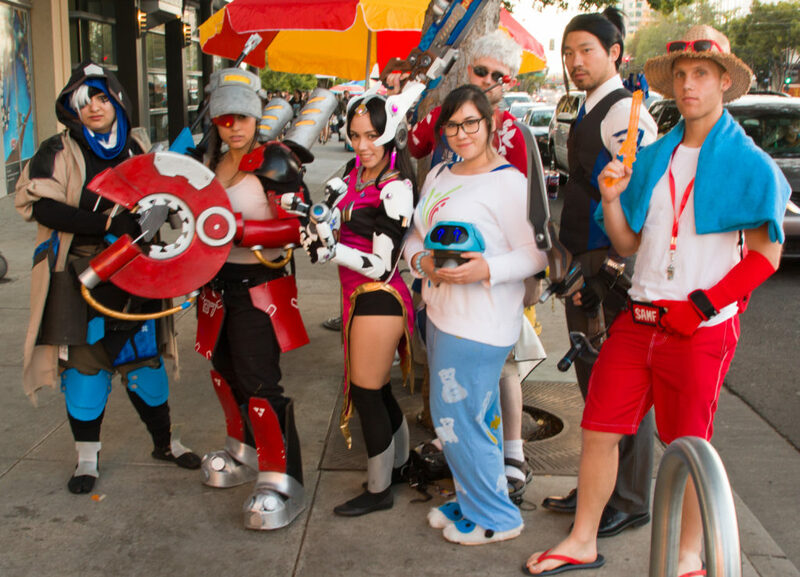 This year for San Jose, California’s popular FanimeCon we went all out with Overwatch. A friend of ours wanted to try out some new prints on his personal 3D printer. Laura wanted to (or maybe was kind of roped in :p) make her own costume, and before we knew it we had six people in our cosplaying group. 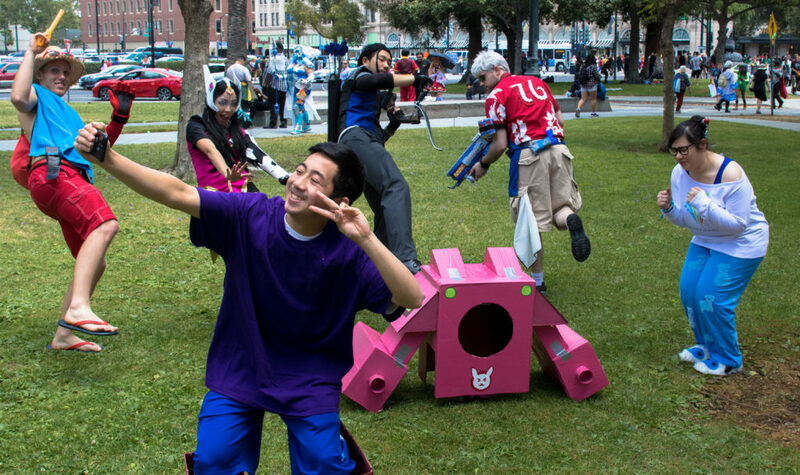 Truly, a perfect comp for an Overwatch cosplay group! But enough about all that. 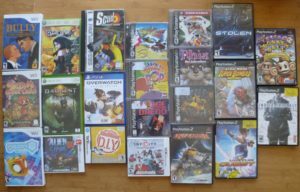 Let’s see some photos! Laura handmade the shirt, pants, and shoe covers! Our friend Matthew 3D printed the hairpiece as well as Snowball. He also programmed Snowball so it has a variety of face animations! 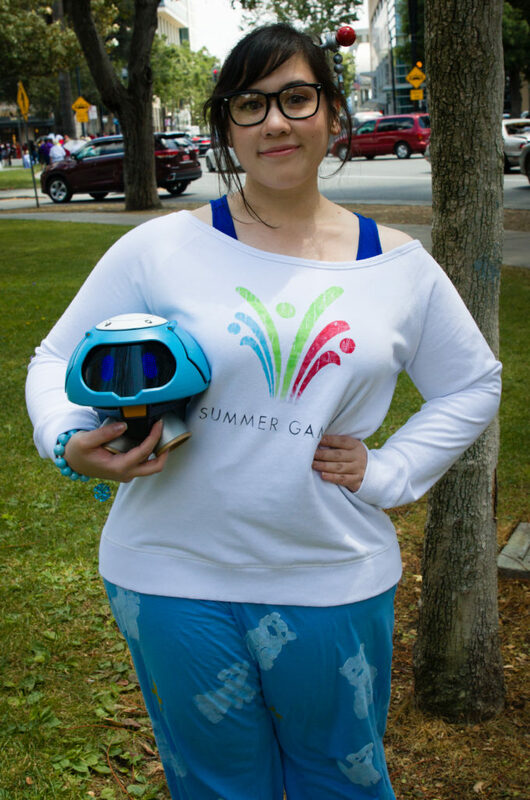 We even found another Mei cosplayer with her own Snowball! Dane was our cowboy, and did everything himself! 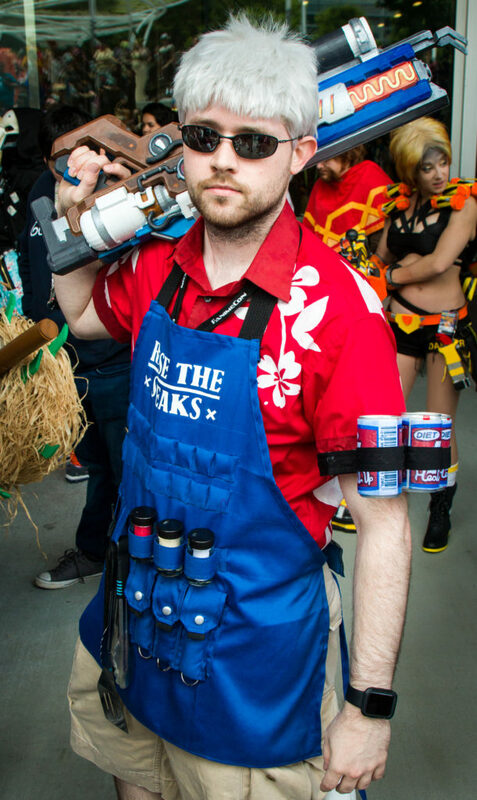 Lifeguard McCree wasn’t as intensive a cosplay, but he still pulled it off with incredible effectiveness! Easily recognizable and with all the hallmarks a Lifeguard McCree needs (including a functioning water revolver), Dane got a lot of “Hey McCree, what time is it?” Thrown his way. Naturally, no matter the actual time of day, it was always HIIIIIGH TIIIIDE!! 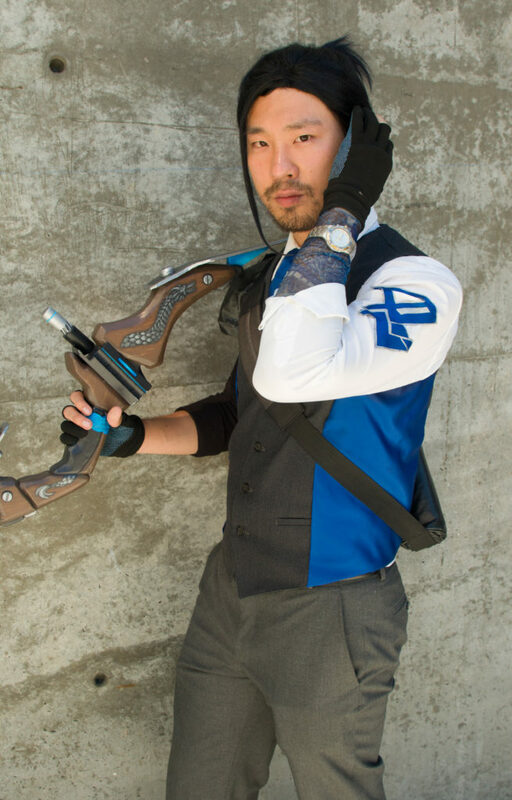 There were a few other Scion Hanzo’s at the con, but none had as badass a bow as ours! Thanks again to Matthew for 3D printing it, as well as his girlfriend Hannah (who sadly couldn’t make it out with us) for painting and detailing it! Jamin also made a lot of his own costume: the arrows and quiver were re-purposed bamboo sticks and a backpack respectively. He altered the top by adding blue fabric to match the actual skin. Laura helped by using the leftover blue fabric to handmake the tie. 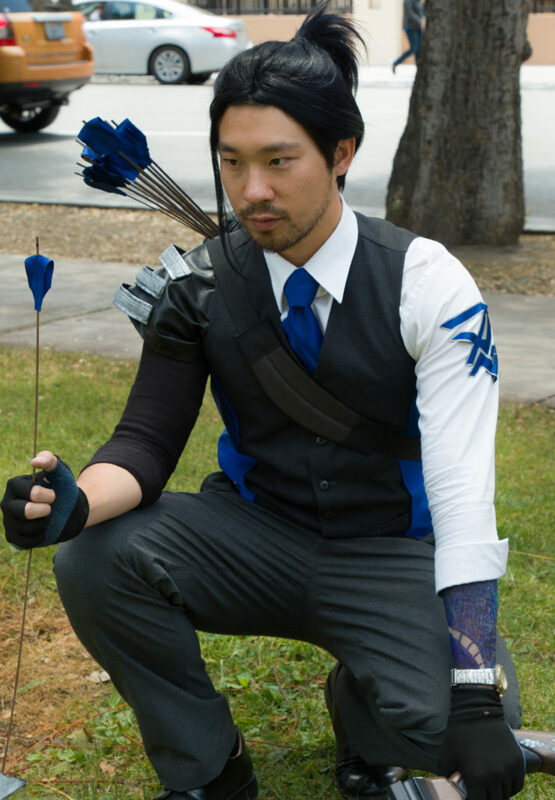 Jamin’s solution to Hanzo’s arm sleeve tattoo was to create a wearable sleeve with pen and marker. It worked rather well, but did leave him with a nice blue arm after all was said and done. 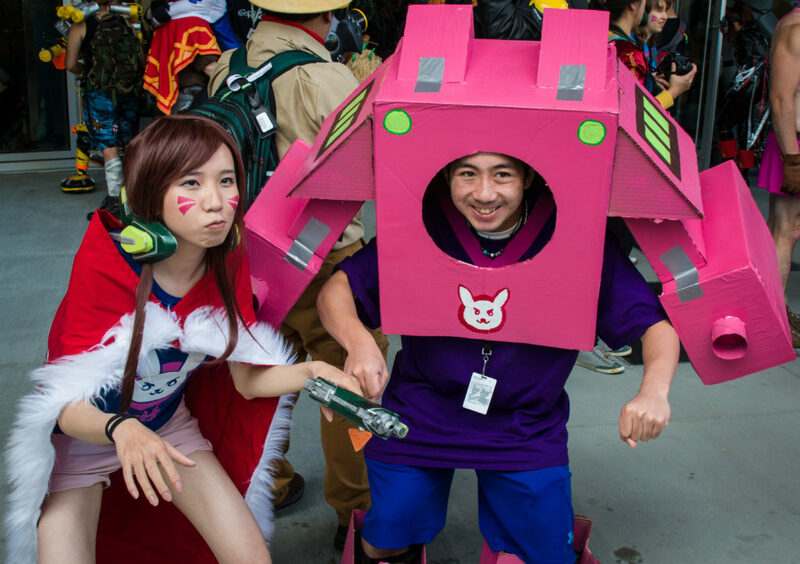 If you want to talk about the biggest surprise of our group, it was how many people loved Axle’s box D.Va! 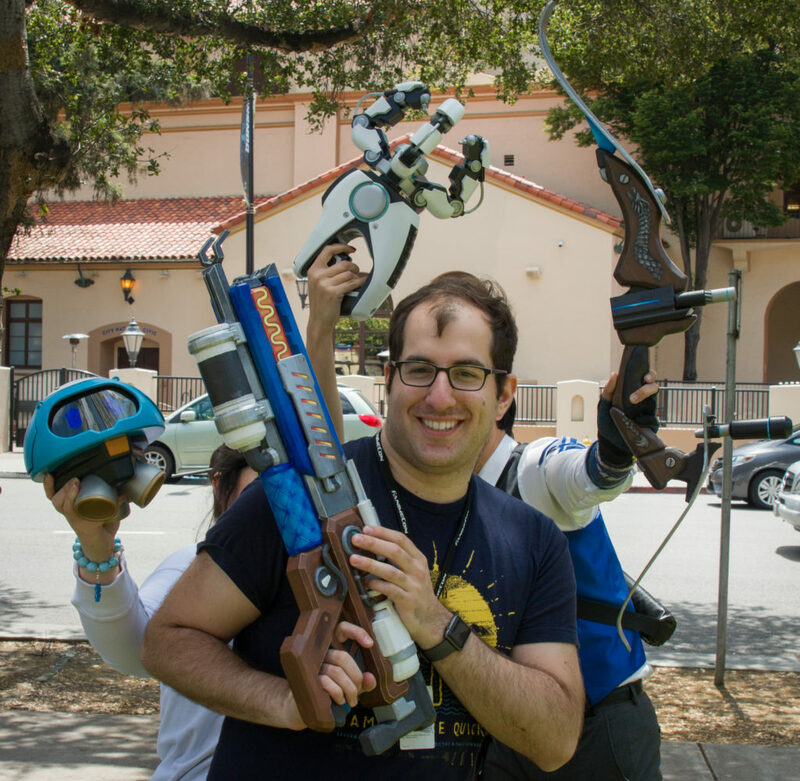 Nevermind the badass 3D printed guns or literal robot we were carrying: a big pink cardboard box stole the show! 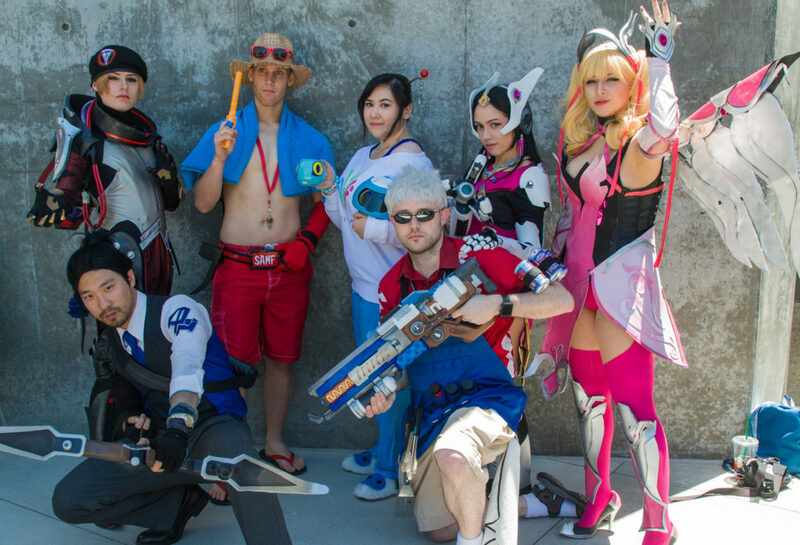 When we arrived at the con, we got there just in time for an Overwatch gathering of cosplayers. Fans literally started cheering as Axle showed up. He was the only D.Va that actually had a “mech”; there were many other Baby D.Vas, but no other Mech D.Va’s, box or not. Axle did this cosplay entirely by himself: he got the boxes from work, spray painted them, glued and taped them together, and by the end of the day was very tired of wearing that big bulky box! Sorry folks: you only got one day with Axle dressed up! Alyssa rounded out our group, and brought with her two cosplays. First up was Symmetra, which was her first time wearing this particular cosplay. 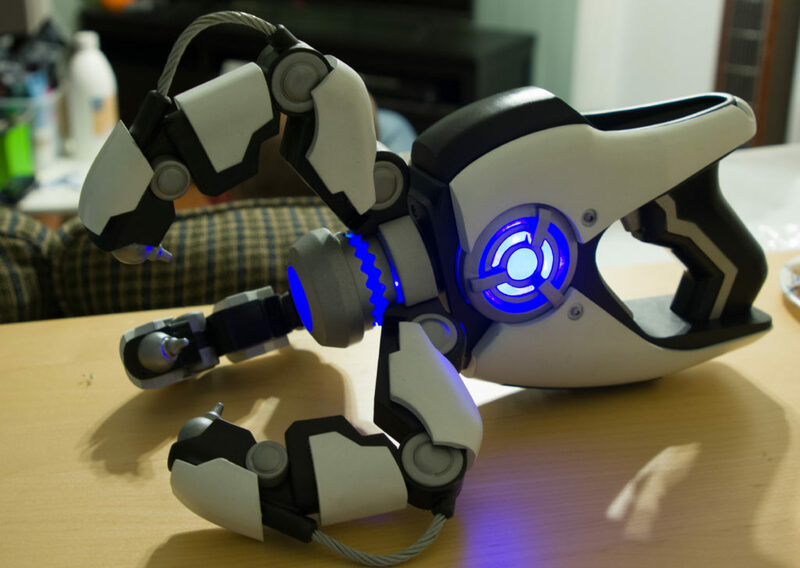 Matthew 3D printed the gun as well, which featured a spinning top, just like Sym in-game! Also, he had stitched the dress, and made the helmet (which lit up with LEDs!). Alyssa was the only Symmetra at the entire con, and was the most awesome looking of our group! A lot of fans really liked the gun, and she got many photos! 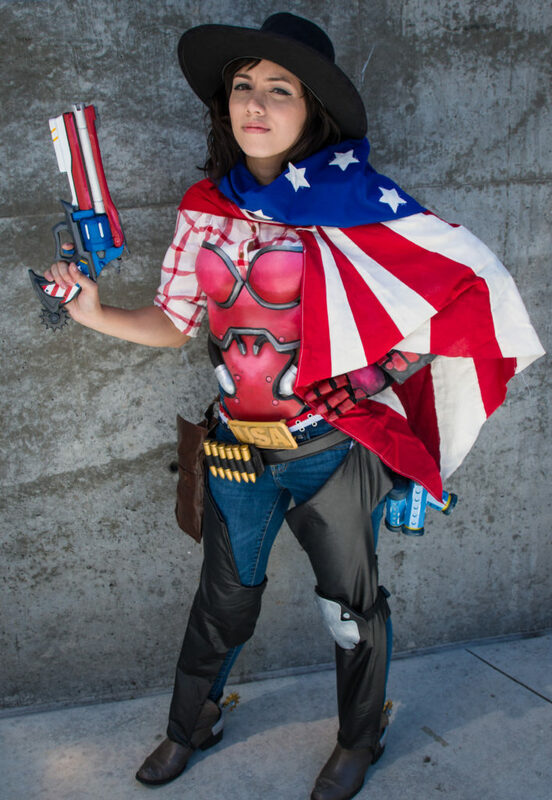 Second up for the final day was her American McCree cosplay. She wore this earlier in the year at PAX South, but this was the first time any of us had seen it since we didn’t make it down to Texas for that event. The detail on the gun and the American flag shawl are big highlights. I also don’t think I saw any other female McCrees there, so another first and only for our group! 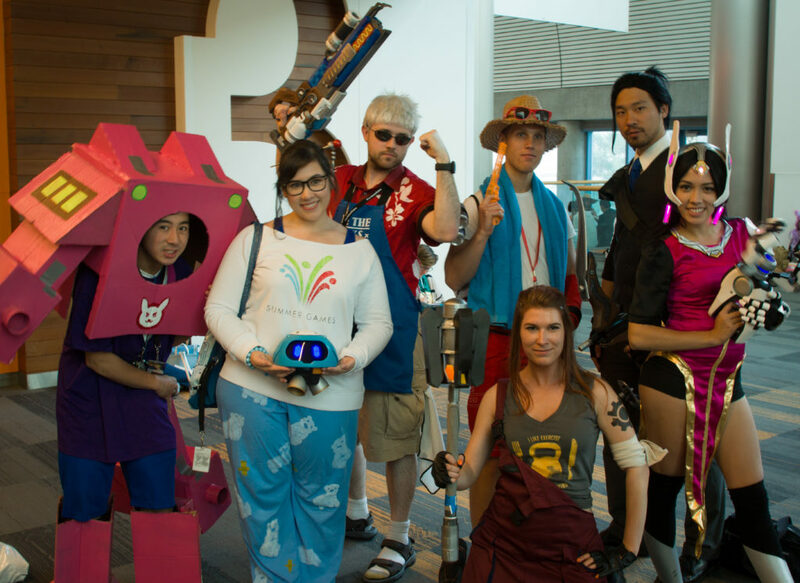 We also got some shots with other awesome Overwatch cosplayers too! Brigitte cosplay was timely and great! One of the few Torbs we saw! 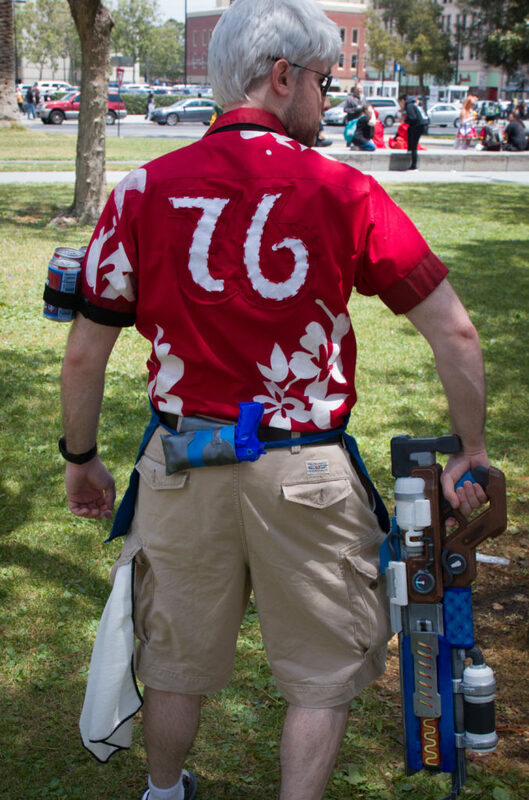 There was another Torb running around with another person cosplaying as his turret! Also, this Ana gave us candy when we left, told us to behave, and then waved bye. Awesome! We didn’t know at the time, but the Moira and Mercy cosplayers here were two of the show’s guests of honor. 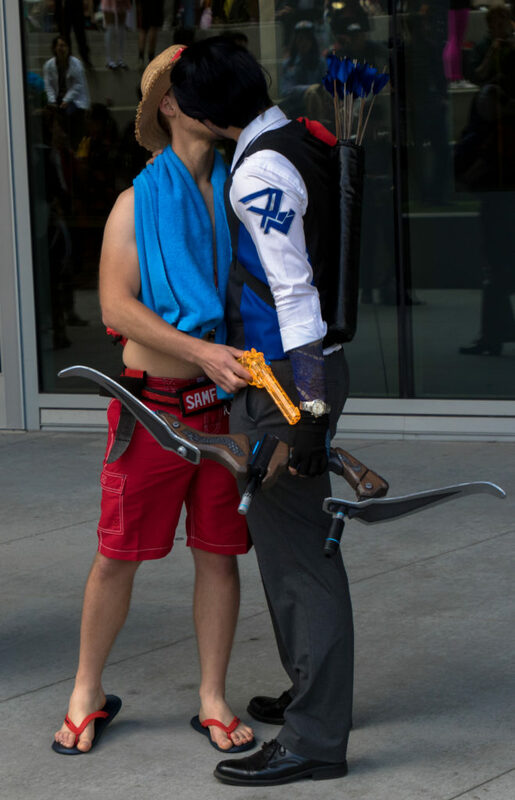 Apparently the are professional cosplayers, and if you could see their effort put in to their costumes compared to the others that were there, you’d see why! They also stayed in character the entire time, talking in accents and as their characters would! Very cool, and a great idea to try next year! Overall we all had a fantastic time! I absolutely loved having people stop us for photos. It was worth all the time, sweat, and tears to make those peoples days! Also, we have some memorable stories too (like someone asking Jamin to sign their Hanzo body pillow!). We’re already planning on doing it again next year, so look forward to that! The real question though, is should we stick with these cosplays again, or try something new? Matthew, what do you think? You were our props mastermind after all! Thank you Matthew! I had a great time and hope you enjoyed seeing everyone adore your work!